There are various kinds of businesses that you can offer to the general public. Some are retail stores that offer clothing and various kinds of garments. Some offer a wide variety of food and beverages. And others offer different kinds of services such as repairing, cleaning, maintaining or maintenance, etc. In spite of the differences between these enterprises, all of these are administered in exchange for money. You can also like restaurant plan forms. These different commercial operations or companies attain their business goals with the help of their employees. Each and every employee is required to engage themselves with the company by perceiving their individual employment form. When all things are settled, part of the pre-employment process is the signing of contract forms. There are different kinds of contract forms, and these are not just utilized for employees. In fact, contracts are also used when two or more organizations agree on some business matters. These are called business contract agreement forms. As you go further, there are different kinds of restaurant contract forms that are often used or utilized in the day-to-day operations of restaurant businesses. An explanation on how you could make use of each of these restaurant forms are provided below. For an additional profit, most restaurants offer services such as catering some events like party celebrations. The management sees to it that all details or specifications that are written in the restaurant agreement form with their customers or clients are met or fulfilled accordingly. As a matter of fact, the restaurant business management congregates for an effective planning with regards to these events. All things discussed are essentially documented in the restaurant plan form for references. 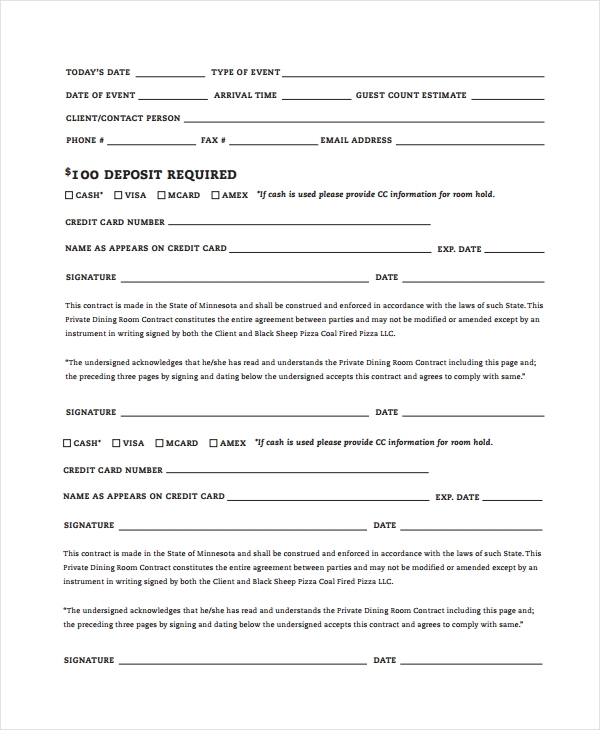 There are further kinds of restaurant form templates. 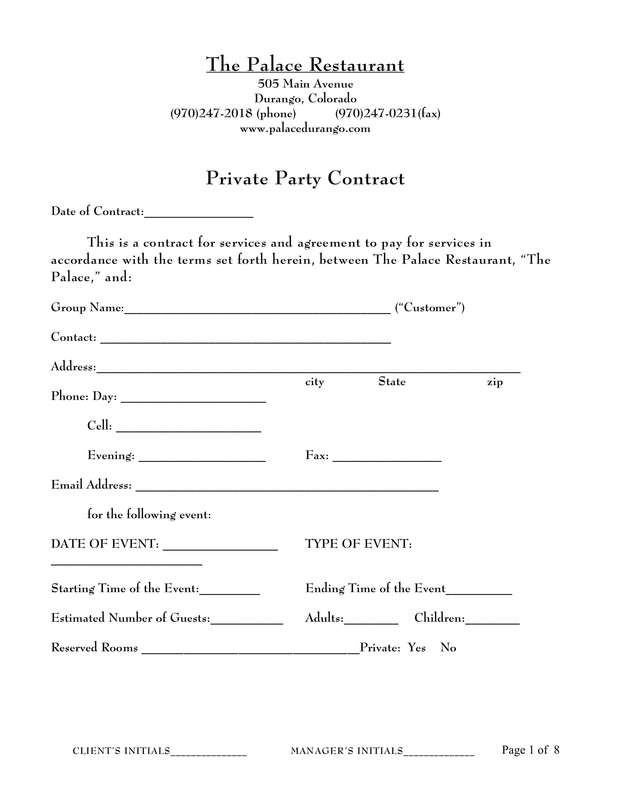 And this restaurant private contract form above is one of which you can utilize when there are some private or exclusive events. For security authorization purposes, these private contract forms are often evaluated with evaluation forms before these are approved. In a business, you have to ensure that you know what and who you are dealing with, most especially when it comes to contract signings. You need to be aware by examining the information forms of each document that comes to hand, and that all important matters are evaluated with the restaurant evaluation forms. Business goals are met if the management knows how to advertise their business. Therefore, they should be aware of the restaurant marketing strategies in order to attract clients or customers for more inquiries. During the inquiries, the terms and conditions, including the amount for deposit, should be discussed. Referring to the sample contract and deposit form above, this is basically with regards to the sum payable as a pledge of the clients or customers for the contract. 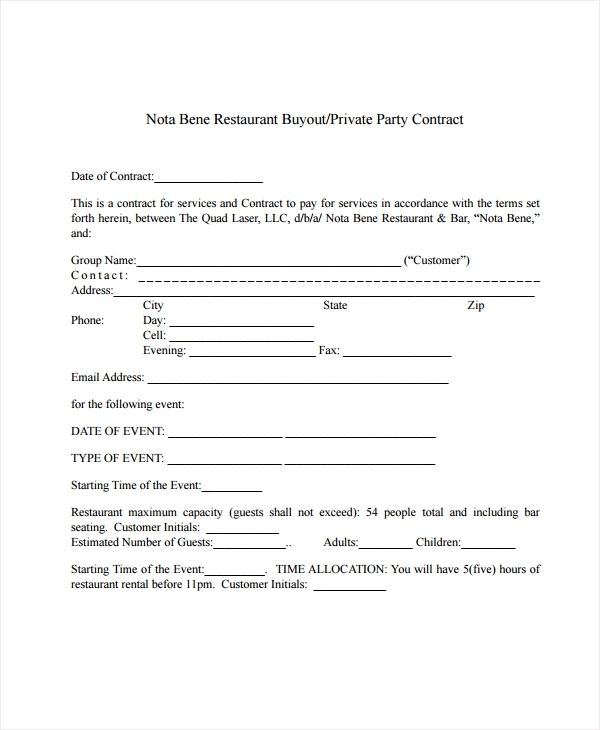 Restaurant agreement forms consist of different kinds of contract forms. 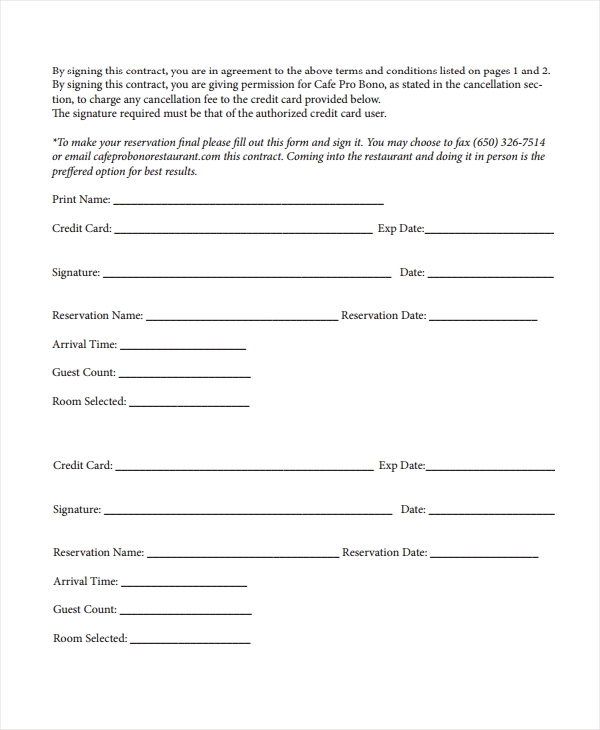 One example of which is provided for you above, the restaurant buyout contract form templates. All the terms and conditions, as agreed between the management and the client, are set forth in this contract. These include the offered services and the payable amount for each services offered. 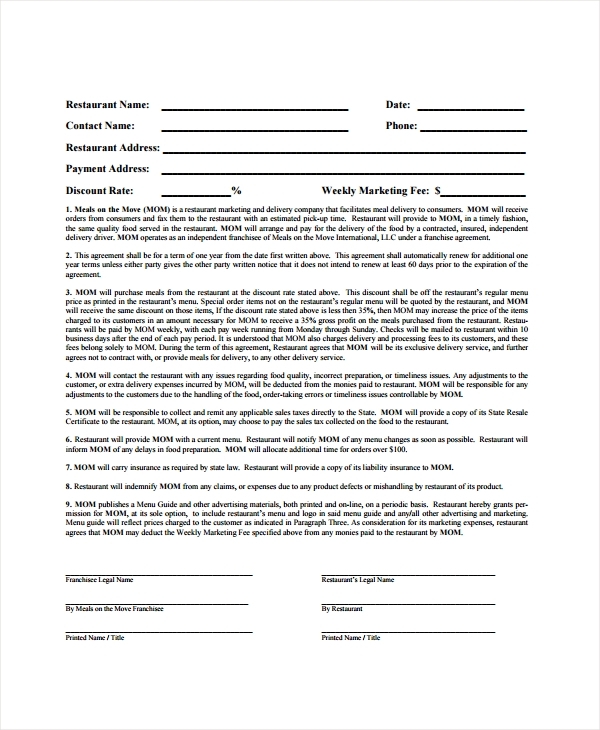 Clients may also apply this kind of contract by utilizing the restaurant application form for buyout contracts. For other inquiries with regards to the usage of both the restaurant and bar, here provided for you above is a contract that is often used to specify the setting and all. In order to ensure that the preferences and needs of the clients are satisfied, a restaurant checklist should be used as a guide for a particular event. 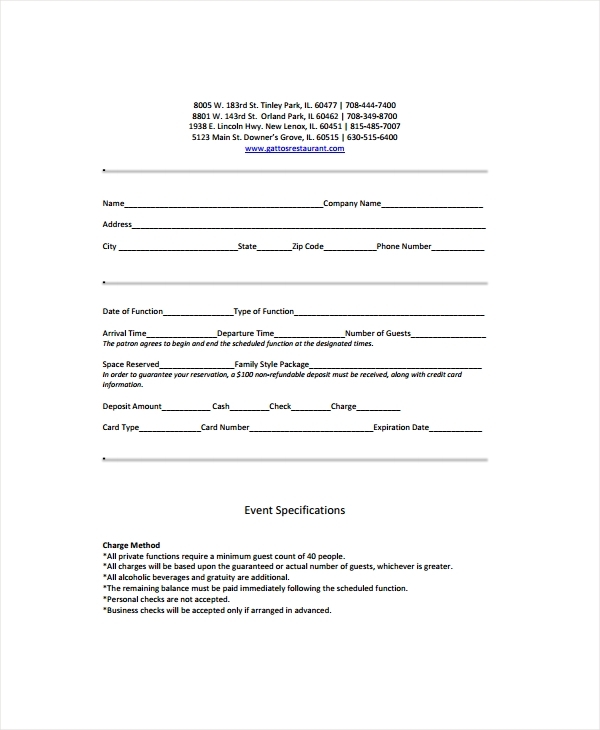 You can also like restaurant management forms. And one of the most effective ways in order for the restaurant services to be improved is by providing restaurant survey forms to the guests. These restaurant contract forms are considered as one of the restaurant legal forms that the management should take heed of. These contracts are powerful documents when it comes to business agreements. Therefore, it is mandatory that these undergo a thorough inspection before the management signs certain contracts, and that all details that are essential should be taken note of in the appropriate inspection form. For the different occasions or events, it is obligatory for the management to conduct an assessment that will help them find all the possible risks and the latent hazards. This assessment could be completed with the use of risk assessment form where they can list all the risks and its nature for avoidance. It is also mandatory that all equipment and operations are maintained. In doing this, the maintenance action form should be utilized for references. Utilize these different forms according to their uses. Ensure that all information or details are provided when filling out the forms. In order to ensure that both the management and the clients have understood all the rules and consequences, a thorough explanation should be provided for each. You can also like restaurant order forms. Also ensure that proper maintenance of the restaurant operations and management is prioritized, and that all possible risks that are found have been corrected and prevented. This could be done with the help of the corrective and preventive action forms. Staffs or employees must undergo an evaluation or examination in order to ensure that they do not have any disease that could be transmitted. This could be done with the use of employee evaluation forms. Another form that could be utilized is the health inspection form. These are just few of the important things that you will be needing to ensure the success of your restaurant business. Feel free to go over the sample forms to further gain insights with what these forms are designed and utilized for. You may also like restaurant reservation forms, restaurant feedback forms.